After reading this post you will learn How to start Online eCommerce Business with Shopify. If you do not have much idea about the tools and techniques required before starting an eCommerce business then I am sure that starting an online store can be a complicated task. A rising trend of eCommerce industry clearly shows that how it is directly affecting the success of a business. A recent report published by BI intelligence clearly shows that there is a rising trend of eCommerce sales since 2010 to 2014. 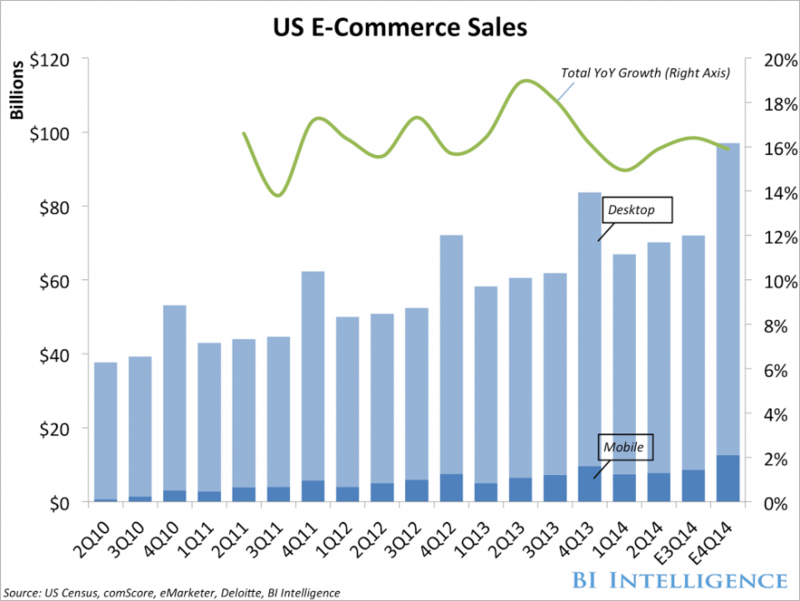 The Single US total online eCommerce business sales were around $39 billion whereas in 2014 it increased to $100 billion. The rising trend not only shows the future of e-commerce industry but also points that now its time to modify the old-fashioned business where buyer pays and sellers give the product. Business should now adapt the new rising trend and should change their business model accordingly. But the question is how we can start an online eCommerce business? The answer is simple use Shopify. It’s a simple tool that helps you to built a great eCommerce website just within few click. When you start an online business there is always a burden of hiring a developer to design and on the other hand security is always a great concern. So, thinking of building an e-commerce site comes with really expensive results. Therefore, to overcome this issue there is a great tool out there on the internet and its Shopify. Shopify is a complete e-commerce solution that helps you to setup an online business to sell your goods without any technical coding skills. It lets you to organize your products , customize your site look and also help you to setup payment methods just with few clicks. It’s a web-based eCommerce software and therefore you don’t have to install or download it. The best part is Shopify store is hosted on their own server, therefore you don’t have to bother with buying and configuring the hosting account. How to start my online eCommerce business with Shopify? To be frank, it’s not a free tool, therefore, you have to pay its monthly fees to run your online business but the best part is you will get free 14 days trial account without entering your credit card details. After going through this link you will find a box to enter you email address. To get the further trial sign up instruction enter your email into that box. You will now be greeted to a page where you have to create your password and store name. Type and click on create your store to continue. Now type required details in an address to set up currencies and tax rates. Click on next after feeling up the details. Finally, follow the instruction showed on the screen to continue. This is how your dashboard looks like. After creating a Shopify account you can start your site just by publishing your first new product. To get more details on customizing and creating your new product please read Shopify documentation. 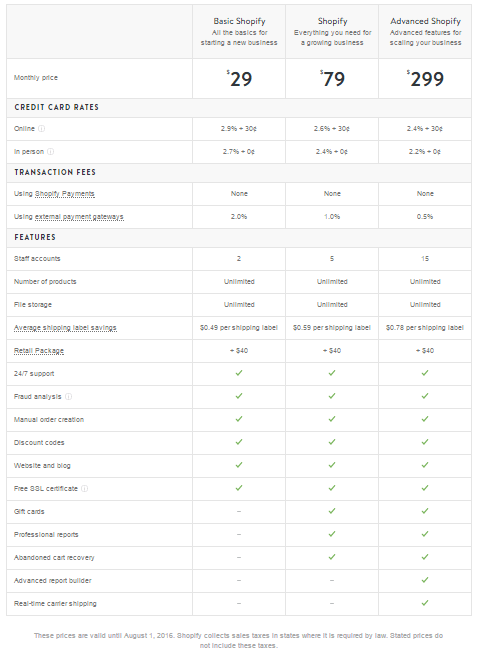 Shopify offers three different price ranges first is basic Shopify plan which starts at $29 per month with credit card processing and other extra features. Similarly, the second one is Shopify that will cost you $79 per month with several extra features in compared to basic plan. Finally, the last one is Advanced Shopify plan which will cost you $299 per month but it is only recommended for the large businesses with huge traffic. Why to choose Shopify as there are several alternatives? I know that there are several cheapest alternatives to Shopify, one of the great example is self-hosted WordPress e-commerce site built using woocommerce. Although woocommerce provides a great free solution but the features provided by Shopify are not neglectable. The features like creating discount coupons, offering gifts cards, amending shipping option and selling on facebook are plus point of using Shopify. Similarly, as Shopify is hosted on their own server, therefore you don’t have to bother with searching and buying a reliable hosting solution. Both free and paid solution have their own pros and cons like in wocommerce you will get an ecommerce solution for free but unfortunately while adding payments methods other than stripe and PayPal you have to pay extra $79 for each option. Whereas in case of Shopify you have to pay monthly fees based on your plan and all the required features for an ecommerce site are preloded inside it.